For my final blog post, I decided to revisit one of my favorite political philosophers for this course: Niccolo Machiavelli. I believe it is his concept of “Ends Justify the Means” that keeps me so interested in him. What it is about this concept that I find so fascinating I’m not exactly sure. Perhaps it is because I find a way to fit this concept into every aspect of our current life? Whether someone is blaming, forgiving, lying, telling the truth, making or breaking alliances, making or breaking rules, making or breaking promises, or even misleading someone, the Machiavellian concept is being applied in some way. Take even school work for example, how many times have you thought to yourself or said to someone, “Just do whatever it takes to get it done”? I mean that is the main goal is it not? To just get the assignment done as fast and as accurately as possible? Of course you want to get a good grade on the assignment but the end mind set is to just get it done whichever way is possible. This is where a student can falter if they are not careful and take Machiavelli’s idea to far, committing plagiarism or even cheating. I like to believe that I am a good person as well as everyone else on this earth. I am genuinely an optimistic person and pretty forgiving, but there is something that causes all of us, and even myself, to step outside our morals and up-bringing and follow Machiavelli. While I was researching Machiavelli, I stumbled upon a famous comic that is an all time classic: Calvin and Hobbes. For those of you who have never read it or heard about it, it is basically a comic about a cat (Hobbes) and boy (Calvin). In this particular episode however, Calvin doesn’t believe in ethics and takes on Machiavelli’s concept of ends justify the means. When the table is turned and Hobbes takes on Machiavelli’s style, Calvin no longer likes Machiavelli’s idea. Calvin thinks that this concept should only apply to him and no one else. A bit selfish don’t you think? Then again he is only looking out for his best interest is he not? What do you think? One last example I found was in a movie called Pride and Glory. In the movie, a brother gets caught up investigating a case that involves another brother and brother-in-law. The family is a multi-generation cop family and their morals are being put to the test. In this specific scene I am posting, two of the brothers who are a part of the NYP, get in an argument about how crime has gone down and collar has gone up. The one is upset about how he got lied to and the other one is claiming that it did not matter because he still achieved the end results he was asked to do. Take a look here Pride and Glory . The number of examples I could find for Machiavelli seem endless. The few I listed above were just the ones that caught my eye and were what I thought practical examples of “Ends justify the means” were. After examining my own life, I came up with a few instances when I have used this principle. One of the main instances is when I play sports. No matter what sport, whether it be basketball or football, I will do whatever it takes to win. This is the view that almost all athletes have adopted who are super competitive I believe. They will play dirty when the ref is not looking or even talk smack. They, myself included, will do whatever it takes to win. It seems that if one thinks hard and long enough, they can relate Machiavelli’s concept to just about anything! Enough about myself, I’m curious to see in what ways you use Machiavelli’s idea of “Ends Justify the Means” in your life. Leave your comments below! 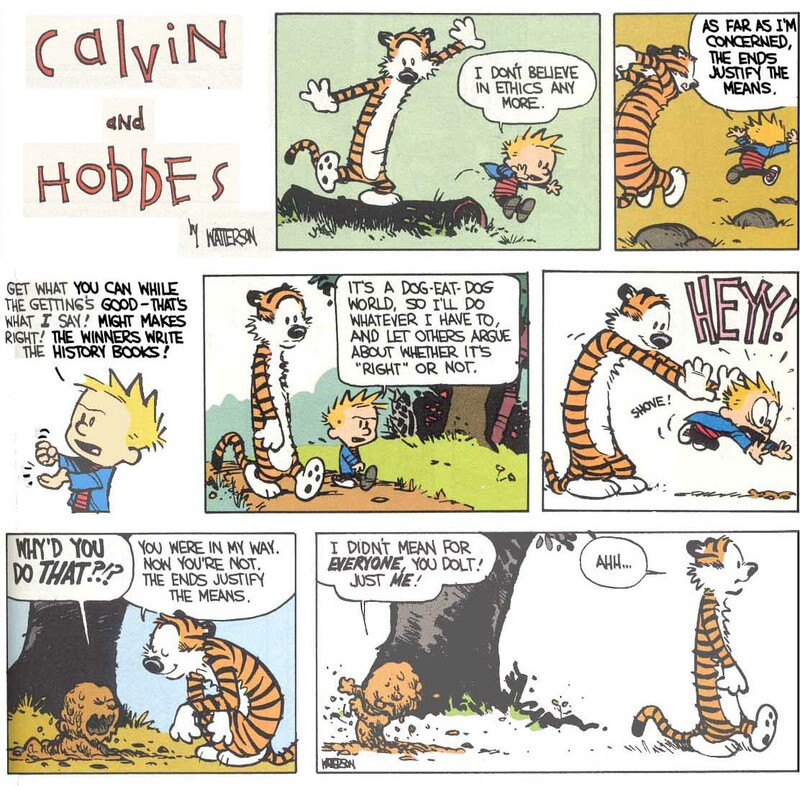 It’s interesting how that Calvin and Hobbes comic plays into Thomas Hobbes, isn’t it? According to Hobbes, of course, people leave the state of nature and enter into a social contract essentially to avoid the bullying of others. In Calvin’s and Hobbe’s case (btw, you reckon the name is coincidental, or no? =), it’s a tense and uneasy contract which breaks down as soon as Calvin begins to contemplate using underhanded tactics to gain the upper hand over others.